Placement in semi-finals were won Bayern Munich, Atletico Madrid, Real and Chelsea London. 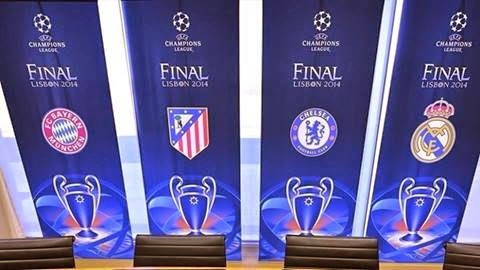 Chosen of Jose Mourinho in the semi-finals will play against Atletico Madrid. The current European champion Bayern Munich in the semi-finals will play against Real Madrid. The first matches will be played on 22 and 23 April, and the rematch seven days later, on the 29th or 30th of April. "I do not think a lot about who we get. These are all great teams and it will be very difficult to play with them," the words are Ribery. Real Madrid footballer Gareth Bale believes his team can fight place in the final against each other three opponents. "I think we can win each of the remaining opponents, but it will be a big fight," said Bale. According to many, the best coach Jose Mourinho is considered today how in the semifinals is everything possible. "Everything is possible in the semis. Sure that we have a great opponent, but we believe in success," said Mourinho ahead of the lottery.